Facet joint neck pain is the second most common variety of apophyseal joint syndrome, beaten only by symptomatic expressions in the lower back. The neck is an area that is certainly disposed towards substantial degeneration of the facet joint structures due to the degree of movement the region endures and the stress that it must manage virtually every waking hour of the patient’s life. Neck pain can be debilitating, but luckily, most cases of facet syndrome in the cervical spine involve manageable symptoms. However, when pain becomes severe, the patient can be utterly disabled and greatly diminished in their physical abilities. Statistically, the neck is also the region where surgery is most often performed on the facet joints, making this topical article especially important for people who want to find relief, but are understandably wary of surgical methods of care. This discussion provides valuable information for patients who are suffering from neck pain that has been blamed on facet joint pathologies. We will investigate the locations where symptoms occur, as well as the nature of the symptoms themselves. Finally, we will analyze the differences between mechanical dysfunction and neurological compression in and around the apophyseal joints, since each separate mechanism will provide unique expressions and might benefit from divergent treatment paths. The most common location for facet joint neck pain is certainly the middle to lower region of the cervical spine from C4 to C7. This area endures the most activity and stress, so it is expected to suffer universal deterioration of the intervertebral discs and spinal joints usually before middle age. In less common scenarios, the upper zygapophyseal joints might suffer from pain, but these instances are much less common than the mid to low cervical levels of the vertebral column. Disc desiccation is considered normal here and a majority of people demonstrate some degree of intervertebral bulging or herniation in one or more levels of the neck. These disc conditions incite the osteoarthritic processes, as well as often affecting the typical spinal curvature of the region. Hyperlordosis or hypolordosis are both common consequences of age-related spinal changes in the neck. Likewise, the development of arthritic activity encourages central and foraminal stenosis, as well as the growth of facet joint osteophytes. The neck is a relatively thin structure that supports a tremendous weight. Furthermore, it must maneuver this weight through an extensive range of motion at all times, except when sleeping. The head is also a huge liability in terms of rapid acceleration and deceleration. It is for this reason that so many patients develop pain due to whiplash events involving hyperflexion and/or hyperextension of the C spine. Mechanical dysfunction in the joint can occur from osteophyte growth in the areas where the joint components interact, inflammation of the protective cartilage of the joint or from ligamentous issues involving joint laxity and tension. Mechanical discomfort is virtually always the result of bone spurring, but the other possible sources are included to help patients who might be suffering from a nonstandard causative process for pain. 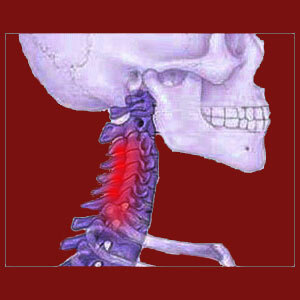 Symptoms of mechanical dysfunction from osteophytes usually include localized pain upon movement of the neck. Pain may be elicited from general cervical spinal mobility or only by specific types or ranges of motion. Pain should not be located far off center of the spine and should not generally move or change in pattern. Inflammatory conditions are usually strikingly similar in expression, but heat might be present in perceived or tangible form. Ligamentous hypomobility dysfunction might be painful in a larger, vertical, linear area or might simply create a feeling of tightness in the neck more than actual discomfort. Hypermobility of the joint may or may not be painful, but can contribute to serious spinal instability. Neurological compression of the small nerves in the facet joint will produce sharp pain, once again usually exacerbated by movement of the neck. The patient might feel sparks of painful activity, followed by periods of tingling and numbness in the region. Symptoms should remain localized to the facet joint region on the center of the neck and should not radiate far from their origin. If a spinal nerve roots is compressed in the neck due to osteophyte growth into the neural foramen, then the expected symptoms are completely different. Pain may or may not be present locally at the site of compression. If it is present, it will likely diminish with time as the nerve begins to lose its signaling ability. Pain might exist at the innervated area of the body, which will be the neck, shoulder, arm or hand, depending on the affected level. Additionally, this innervated location will likely progress to suffer paresthesia, objective numbness, weakness then dysfunction, if the compression continues. It should be known that some compressive neuropathies will resolve organically, but this is less commonly seen with bone spur-related impingement. There is a reason why facet joint surgery is so commonplace in the neck. It is because it is highly effective for resolving the structural issues that are the root causes of pain. While no surgery is risk-free, the procedures used to decompress the cervical facet joints generally have fewer complications than those utilized elsewhere and statistically provide better therapeutic outcomes. However, before undergoing surgery, patients are still advised to consider the benefits and limitations of more conservative care practices. More importantly, before acquiescing to any type of treatment, patients are best served by making absolutely sure of the accuracy of their diagnosis, since incorrect identification of facet syndrome as the origin of symptoms is a terribly widespread problem in the dorsalgia treatment industry. If the diagnosis is incorrect, then treatment, regardless of which type, stands virtually no hope of providing positive and satisfying results. Neck-Pain-Treatment.Org is the best resource for researching a wide range of neck pain issues, including conditions caused by facet syndrome and facet joint injury.